With the sub-rack assemblies now in place, the signal cables can be connected. These come from the patch panels, under the false floor and up onto the F-type connectors on the front of the processing units. Until now, the signals have been analogue from the antennas, front-end amplifiers and electronics through to this point. Once they go into the receiver units they are subjected to some final amplification, switching and filtering, but are then digitised. From then on, the signals are digital and all subsequent processing happens in the digital domain. 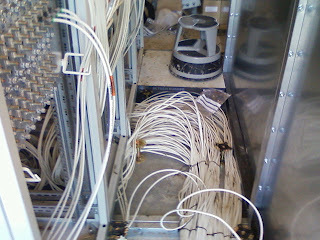 Caption 2 : Sientje Hartman (Excel Assemblies) makes excellent progress in patching the signal cables into the RCUs. Soon many of the panels are covered in connections.